On November 23rd, 1918, the Saturday before Thanksgiving, a Parade was held in downtown Louisville to commemorate the end of the first World War. 10,000 troops from Camp Zachary Taylor, as well as marching bands and civic groups made their way from Clay and Broadway past the courthouse and ending at Central Park amidst tens of thousands of cheering Louisvillians, according to the Courier-Journal. This was the first official parade commemorating the victory of the Allied Powers in World War I, but two previous unofficial parades were also held in Louisville. The first, on November 7th, was described as a "riot of joy" by the C-J, after a fire station bell was rung and mistakingly taken as notice for the end of the war, creating an impromptu parade down 4th street. 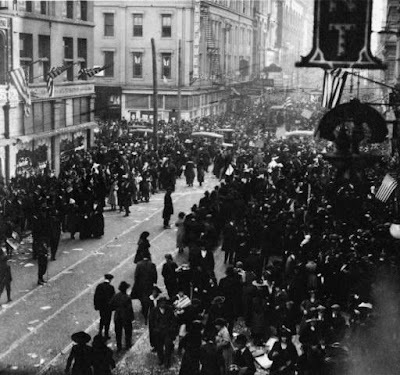 The second parade occurred on November 11th, Armistice Day, the actual day the war ended, and began at the Courier-Journal offices by publisher Judge Robert Bingham and spilled into the street. Thousands joined the parade that stretched for half a mile and included fireworks and a lynched effigy of Kaiser Wilhelm II with a sign that read "Damn His Damn Hide" hanging from the C-J office windows.